The Inference Activities 2nd Edition has many important updates and improvements that will help students with language and reading comprehension difficulties learn vital inference skills. The workbook is an easy to use resource that will engage your students with high interest scenarios. Each scenario contains shallow level inference and deep level inference questions, which help to prompt students' critical thinking and problem solving skills. For school students ages 9 -14. The 2nd Edition includes material on Communicative Reading Strategies which are language intervention techniques that allow even deeper exploration of the featured fiction and non-fiction scenarios. Inference Activities 2nd Edition features an inference pre and post-test. Also included are progress charts to track your students’ progress as they work through each chapter. The 2nd Edition book has newly expanded and improved fiction and non-fiction scenarios. Many of the scenarios feature up to eight detailed inference questions to expand and stretch your students’ inference abilities. The 2nd Edition book has 832 inference questions in total. 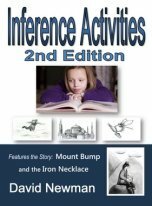 The new edition of Inference Activities contains the fiction story, Mount Bump and the Iron Necklace, which is a unique opportunity to explore multiple inference and comprehension questions wholly centered on a complex, detailed, and original story. This 310 page resource will be of high interest to classroom teachers, speech-language pathologists and parents of children with language and literacy difficulties.